From a radiant in the constellation of the Twins, the annual Geminid meteor shower rained down on our fair planet this week. 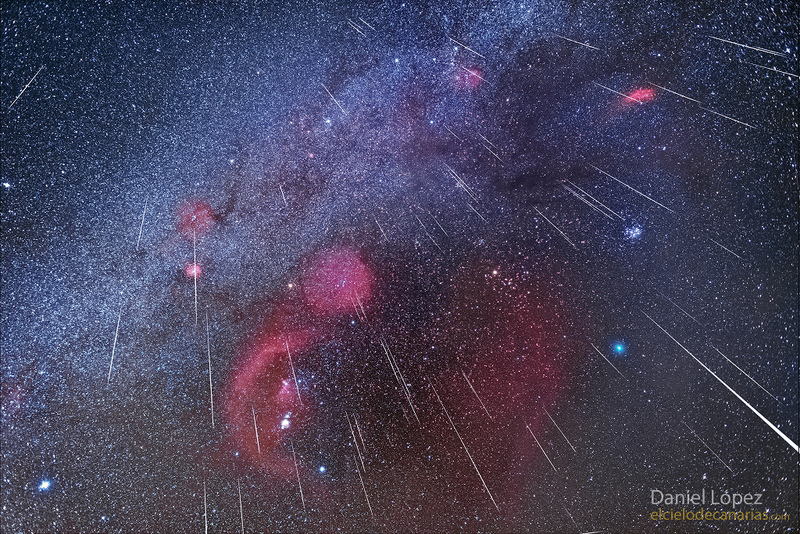 This beautiful skyscape collects about 70 of Gemini’s lovely shooting stars in a digital composition made from multiple exposures. The exposures were taken over a six hour period near the shower’s peak. The camera was tracking the dark predawn sky on December 14 from Teide National Park on the Canary Island Tenerife. Though Gemini lies off the top left of the frame, the Milky Way sweeps through the starry background. Sharing the sky below and left of center are recognizable stars and nebulosities of Orion. A yellowish Aldebaran and the Hyades are toward the right along with the Pleiades star cluster. Also a welcome visitor to this night sky, the faint green coma of Comet 46P Wirtanen, closest to Earth this weekend, lies below the Pleiades stars. Dust swept up from the orbit of active asteroid 3200 Phaethon, Gemini’s meteors enter Earth’s atmosphere traveling at about 35 kilometers per second. Posted on Saturday, 15 December 2018 by VGC	This entry was posted in ifttt-photograph and tagged IFTTT, NASA. Bookmark the permalink.